Update 2018: Covecastles has closed. 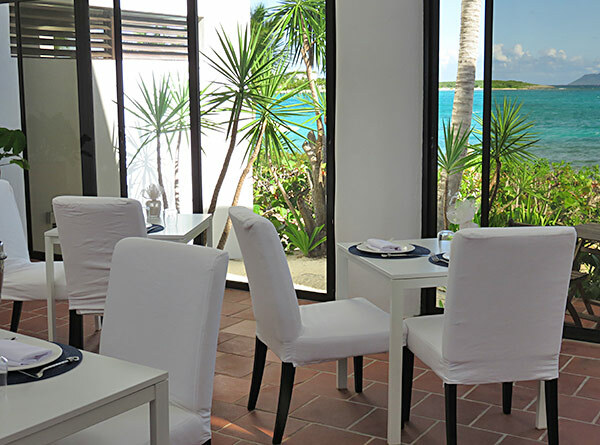 In 2015, we fell in love with Covecastles Restaurant. The luxury hotel had re-opened its restaurant's doors to the public, no expense spared. With Executive Chef Marc Alvarez, a Forno Bravo Roma wood fire oven and a Grillworks grill, the cuisine quickly became the island's best. Chef Marc left the team in the summer of 2016. However, hope was not lost. 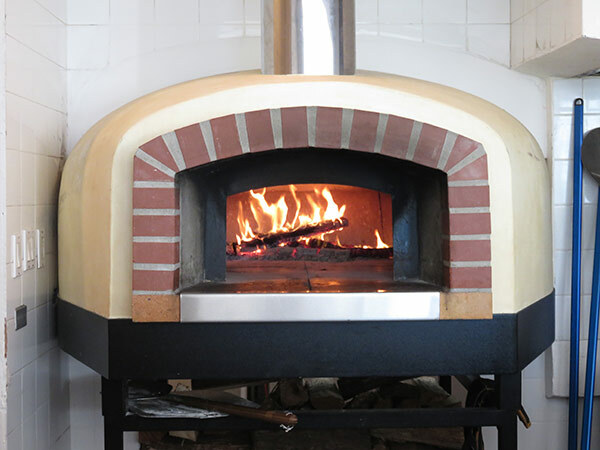 Joy was restored when we discovered that Covecastles Restaurant would remain open, with the Forno Bravo Roma oven still lit. 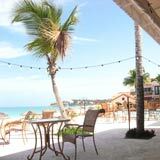 Today, Covecastles is open for breakfast and lunch. A peaceful setting to start the day and/or for a mid-day break, Covecastles' ambiance is serene. White chairs and tables are offset by terra cotta tiles and tropical greenery. 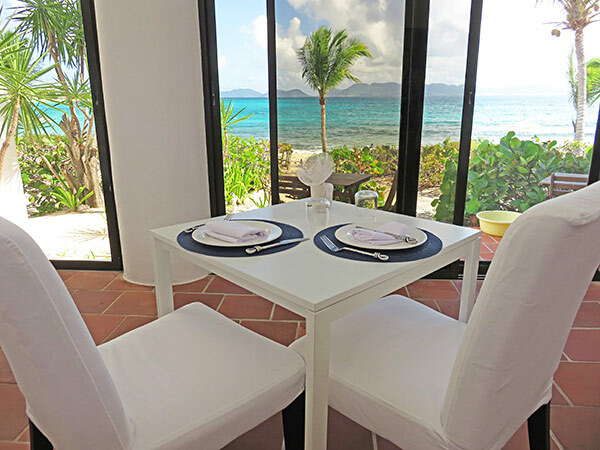 The whole dining room gazes out to the Caribbean Sea and St. Martin in the distance. 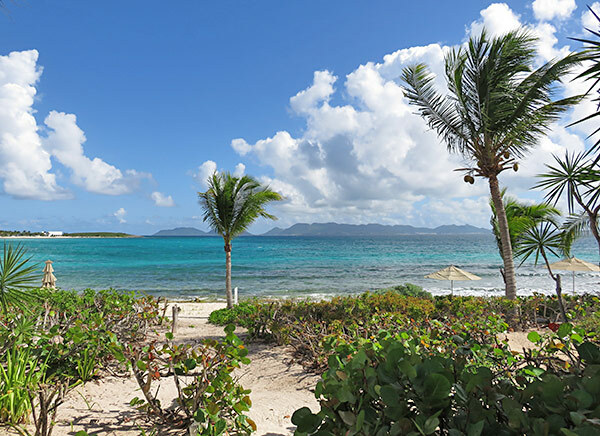 Because Covecastles faces south east (where Anguilla's tradewinds blow in from), the breeze is constant and cooling. Heading up the culinary team at Covecastles Restaurant is Judy and Jermaine. 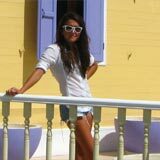 Brother and sister, they were born in Anguilla and have been with Covecastles for over a decade. Judy started her career with Covecastles over 20 years ago. Jermaine joined Covecastles 10 years ago, after learning the ropes of the kitchen at Blanchards. They both worked with Chef Marc. He honed their skills, showing them the ins and outs of preparing haute cuisine. Today, they run the show. Two warm and gracious souls, you are in good hands with Judy and Jermaine. The lunch menu starts with "Composed Salads." Breaded snapper Caesar, oven-roasted crayfish with avocado, spicy game hen and a roasted shrimp salad all make up the menu. The roasted shrimp salad is a new favorite. 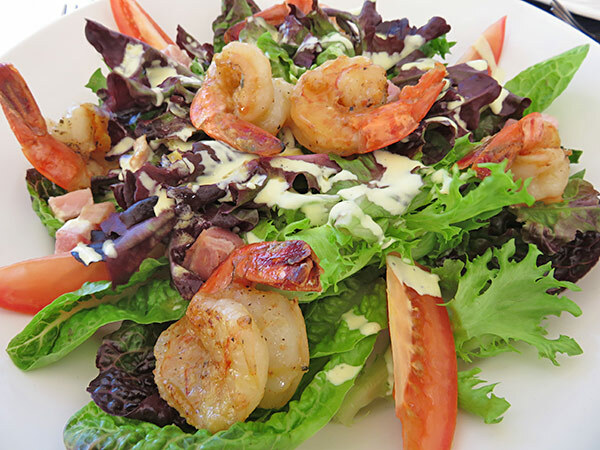 Roasted shrimp is placed on a bed of fresh mixed greens, pancetta is thrown on top and it is laced with a creamy vinaigrette. Light and refreshing. This is not your average bacon cheese burger. A thick patty is layered with a sizable slice of cheese, lettuce, tomato, ample bacon and sweet, house-made pickles. Hand-cut French fries are served on the side. 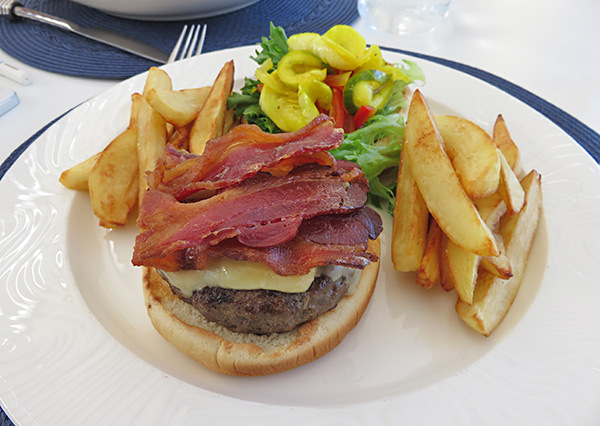 Outstanding in every way, Covecastles' bacon cheese burger is decadent. Last, but certainly not the least, the star of the show... Covecastles' pizzas. 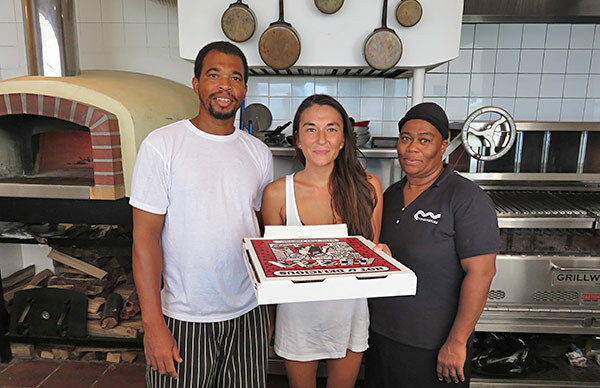 We developed a love affair with Covecastles' Bianca pizza in 2015. When we heard that Covecastles Restaurant was changing, panic set in. "Would they still have our beloved Bianca?" For all fans of Bianca, rest assured. It is still on the menu. 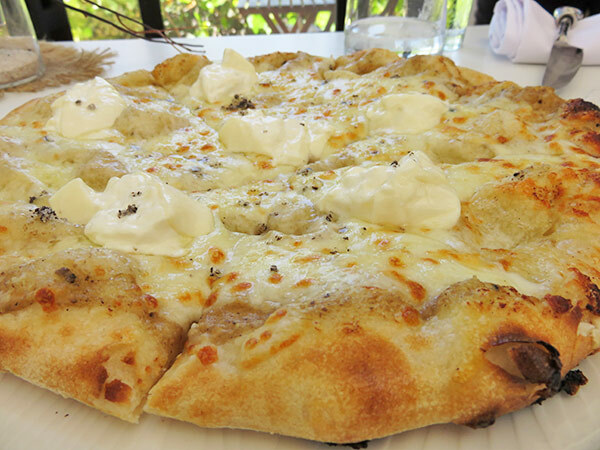 Sumptuous and savory, each bite is rich with a myriad of cheeses (truffle fromage, pecorino pepato, mozzarella, ricotta) and a hint of roasted garlic. Jermaine and his wood fire oven cook the crust just right. Crisp and firm on the outside, with just enough chew on the inside. This is pizza perfection. 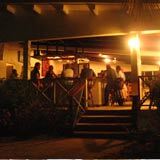 The best in Anguilla and out. 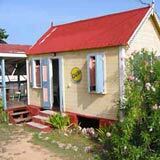 A tranquil escape with excellent cuisine and warm hospitality, Covecastles Restaurant and Judy & Jermaine delight! Stay tuned for the breakfast report. 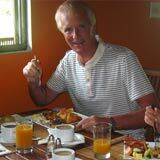 Covecastles is open daily for breakfast and lunch. For reservations, call: 264-497-6801.